Finally I'm going to take a look at the leader of everyone's favorite idol group! 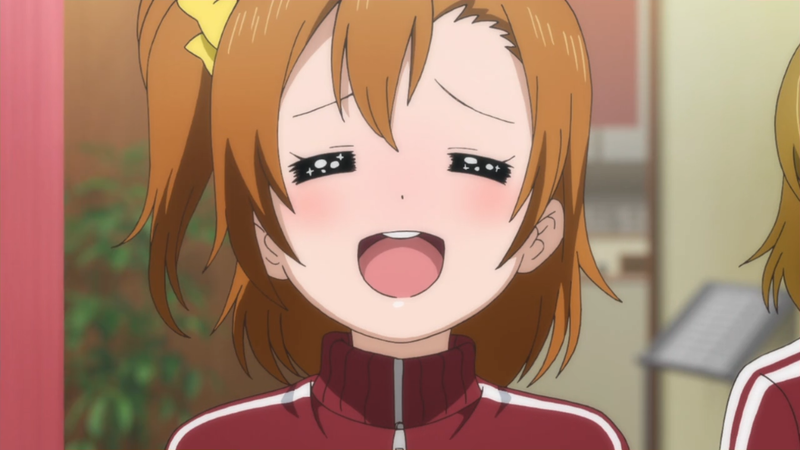 Kousaka Honoka is an energetic girl who may seem rash and selfish sometimes, but that only makes her more human and in that aspect, more endearing to fans. Here I have all three of them in their infamous Bokura wa Ima no Naka de poses, as if they are in a performance mid-song. Sadly, I didn't order any of the Love Live! Nendoroids from Good Smile Company and hence don't have any of their exclusive bases to make my display appear more stage-like. 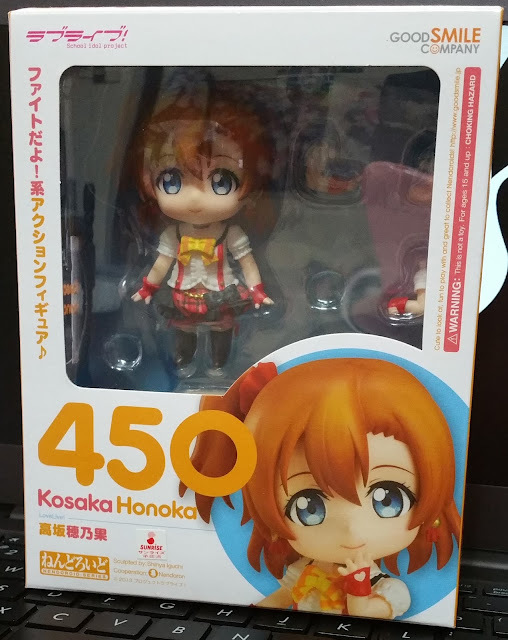 Orange is Honoka's image color and Good Smile Company plays well by making this her main color. In addition, they have contrasting colors like pink and blue to help add more life to this box. 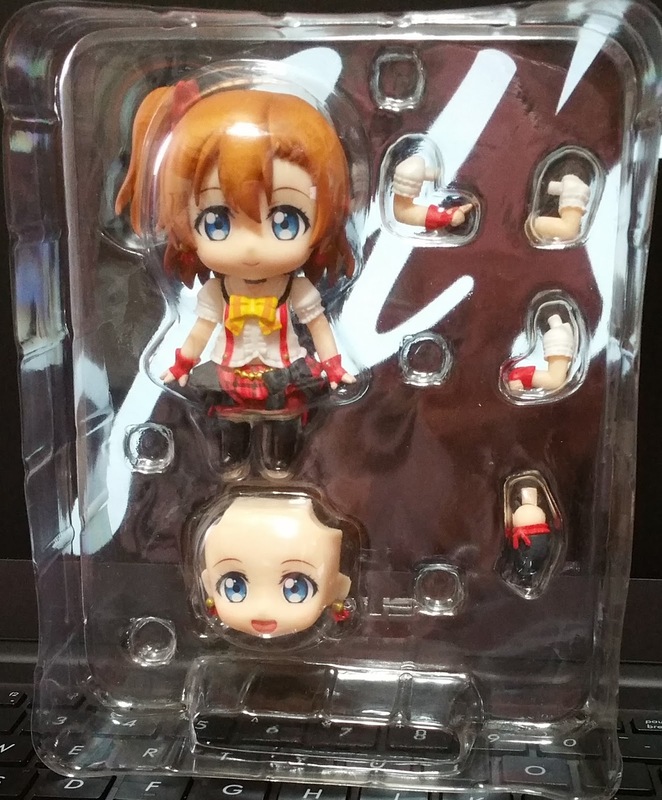 Honoka comes with simple parts. She has several exchanges of hands -- one to pose her with her hand on her hip, a bent arm with a gun pose, and another arm without a hand -- a bent leg, and an additional face-plate. Sadly, the main difference between the two face-plates is that one has a closed smiling mouth while the other has it wide-open. 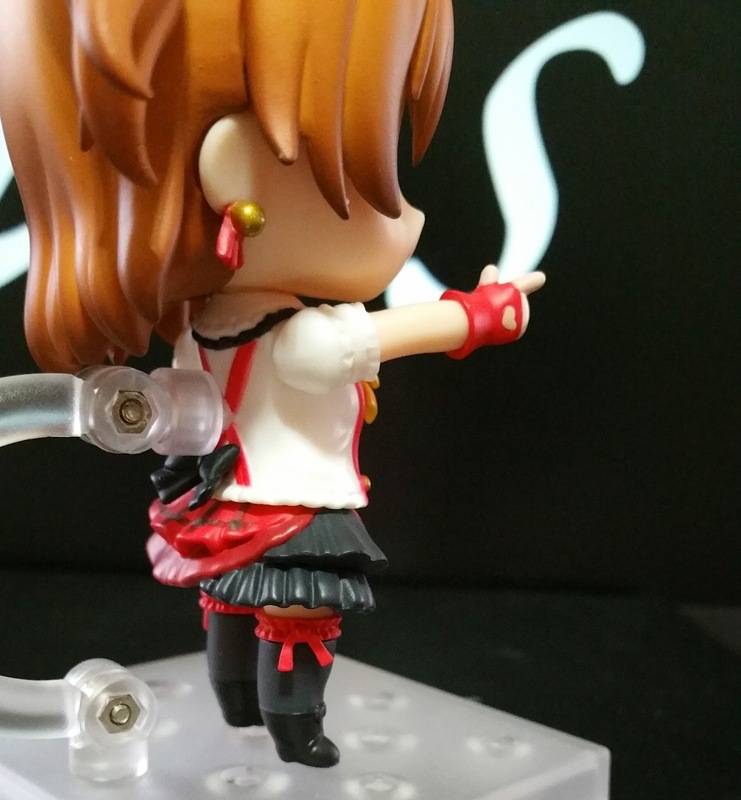 It's another normal Nendoroid base. 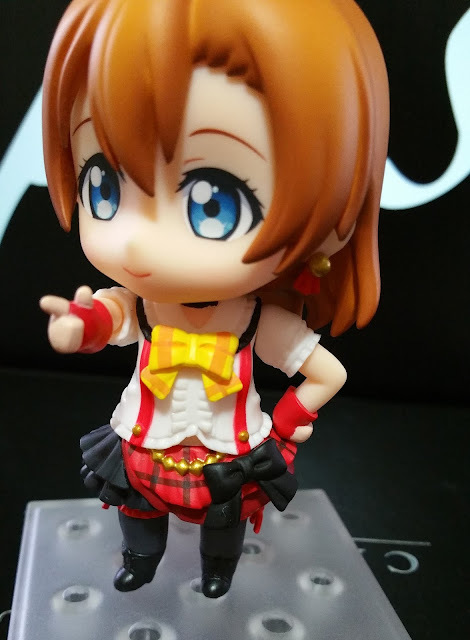 Fortunately for mine, it fit Honoka well, albeit a bit tightly, so I had no fear that I needed to file the stand to fit or that the Nendoroid would fall off the stand if moved. 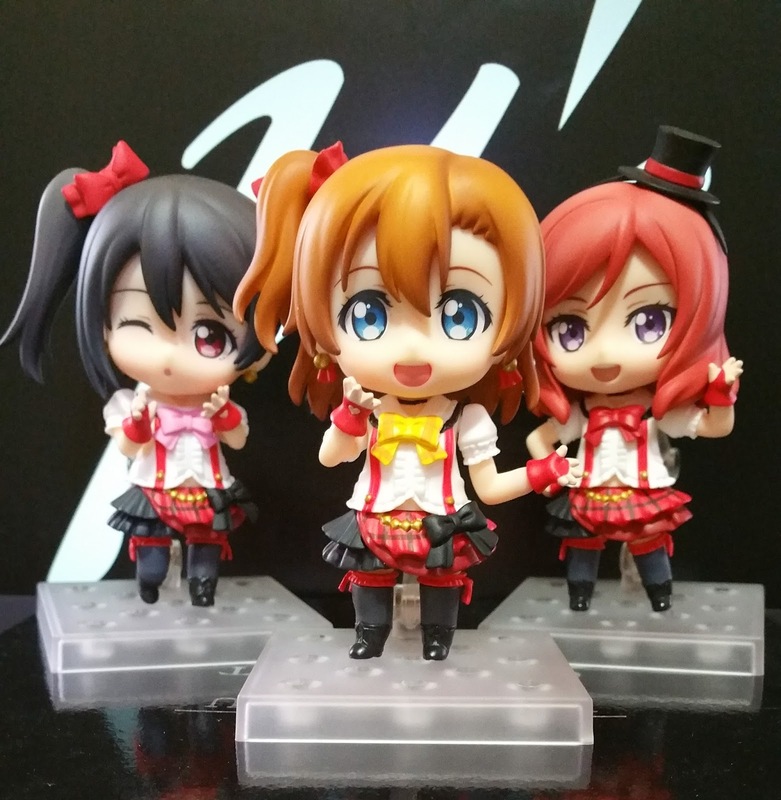 The lights from this make it seem like Honoka is right on stage and the spotlights are all focused right on her! Sadly, Honoka doesn't come with a lot of parts, or parts that have much variation. This clearly restricts her freedom of posing and leaves her looking pretty tame no matter which pose you put her in. Maybe that would be different if you match her with her Training Outfit Version parts, but that doesn't change how bland she is as a Stage Nendoroid alone. Perhaps because she came with so few parts, assembly is much easier than expected. I could also easily decide on a pose to put her in because there aren't that many choices in the first place. 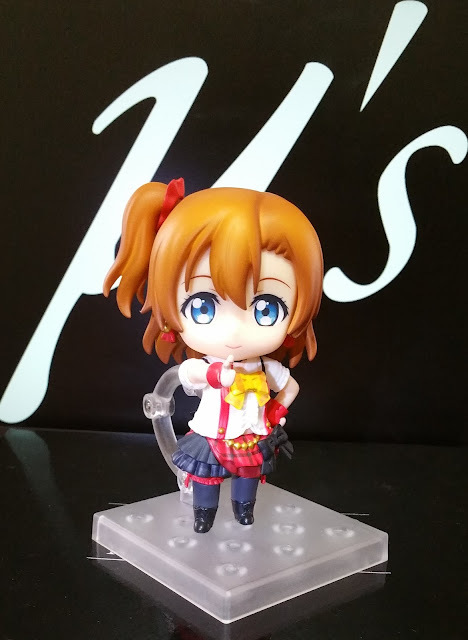 Honoka's sculpt is pretty amazing in its own way and it does make up for her lack of parts. Ill start from her hair sculpt first. Her hair seam is well-hidden and doesn't look out of place. It also merges well with her hair shape, along with the side parting. The criss-cross parting likes on the top of her head is a cool detail to add as well. My only gripe would be the white spot on the right side of her bangs, but slight mess-ups like this when you are producing on a huge scale is imminent. 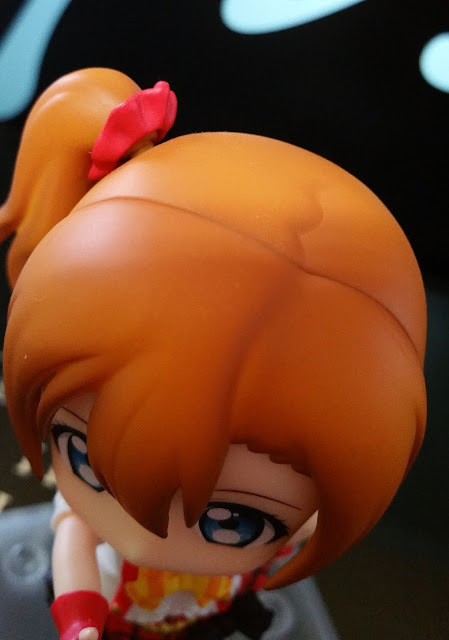 Of course, Good Smile Company hasn't forgotten to add in the her trademark parting hairline above her left eye. Her earrings are also in place and the large circular part with golden shade makes them look slightly comical, which is perfect for a Nendoroid (chibi!). The painting for her glove is well done as well, with no paint spills over to her fingers. 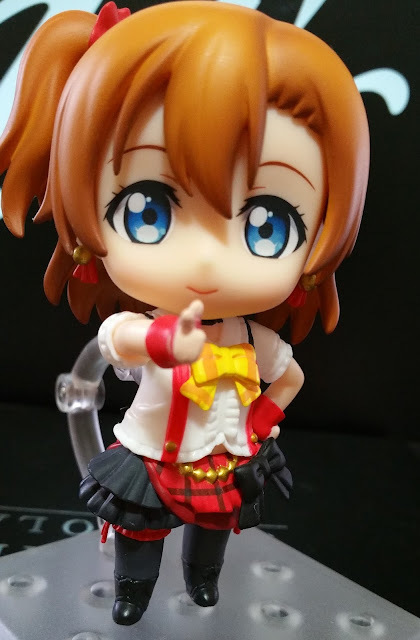 I admire and at the same time, wonder how Good Smile Company is able to accomplish that, especially with the thin line of red going in between her thumb and index finger. Her outfit is done pretty crisp and clean as well. The colors are spot-on and Honoka's yellow ribbon, with stripes of orange going down it gives a slightly different feel from the flat black ribbon on her skirt. This actually adds dimension and prevents the two large ribbons, which are situated so close together, from overwhelming the figure. I would also like to take this chance to mention about her earrings as well! I like how detailed the red tassel-like object is! Her glove is also well-painted, with reference to the lack of paint spills from the red glove to the back of her hand in the heart-shaped cutout. But more importantly, I'll like to mention how the black layers of her skirt reflects the light! It catches the light at the right spots, giving the flat black more life by making the light and shadows give it more depth! 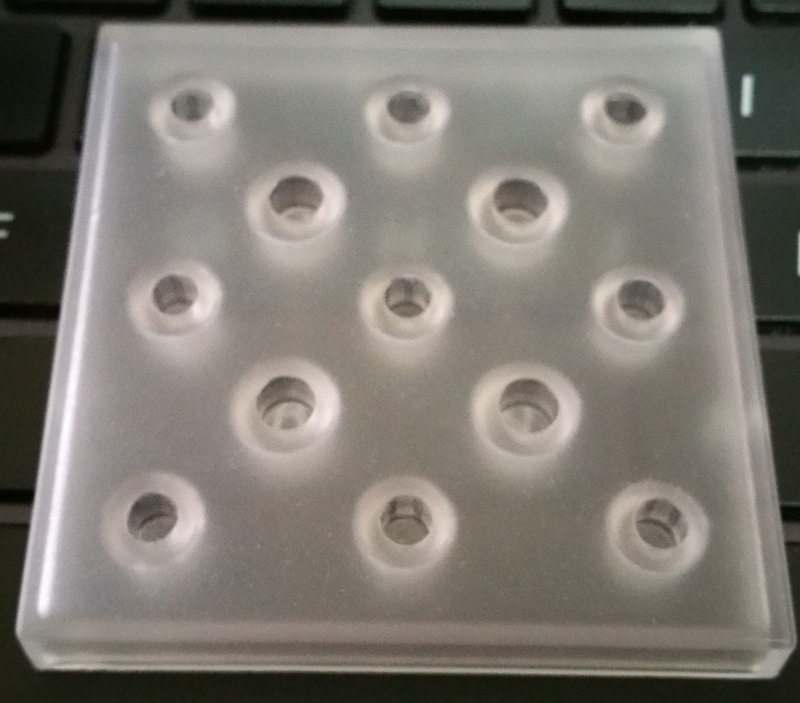 This also helps in enabling the skirt to appear more lightweight even though the piece has at least 4 layers (2 red, 2 black)! No Comment to " Figure Unboxing and Review: Nendoroid Kousaka Honoka Stage Version (Good Smile Company) "